We are now in the process of leaving the beta phase for our Core API. If you have beta API keys, you'll need to upgrade them to production keys in order to avoid an interruption in service. To help with this, we have developed a 3-step upgrade path for our beta key users. Please note: This step is only necessary if you don't see your beta key in your API Dashboard. 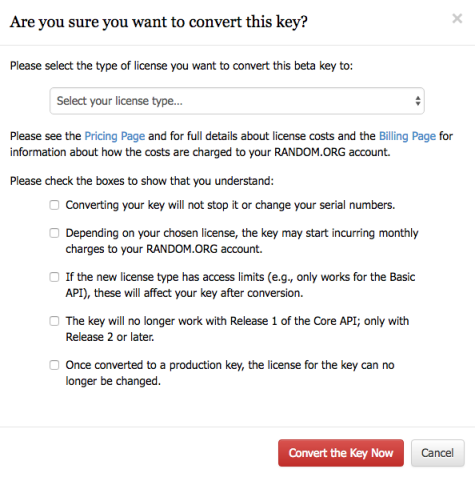 This step will migrate your beta keys into your RANDOM.ORG account, such that you can manage them via our new API Dashboard. Migrating a beta key will not change your key or its daily limits, and it will not cause any interruption in service. Make sure you have a RANDOM.ORG account to hold your API key. If your beta key was created before 1 March 2019, we asked for your email address to send you the key, but we did not automatically create a RANDOM.ORG account to hold the key for you at that time. However, you may have created a RANDOM.ORG account separately (by following our regular signup process), and if you do, you can now use that account to hold your API keys. If you don't have a RANDOM.ORG account, it is easy to create one. Login to your RANDOM.ORG account, newly created or otherwise. Enter your API key into the API key migration form and submit the form. You will receive an email to the email address you used when you registered your beta key. Please click on the confirmation link in that email. Your beta key will now appear in your API Dashboard. Please note that your RANDOM.ORG account can hold a maximum of ten API keys at this time. If you need more, please send us an email. Please note: This step is not optional. Production keys will not work with Release 1 of the API. For the vast majority of clients, no further changes should be required. For full details about the differences between the two releases, please see the Release 2 API documentation. The final step is to convert your key to a production key. To do this, you first need to decide which license is right for you. You will find the list of licenses on our Pricing Page. Clicking on the button will open the conversion modal, which you see below. To proceed, select the desired license from the dropdown menu, then check each box after you have made sure you understand what it means. Finally, submit the form to complete the conversion of your key. 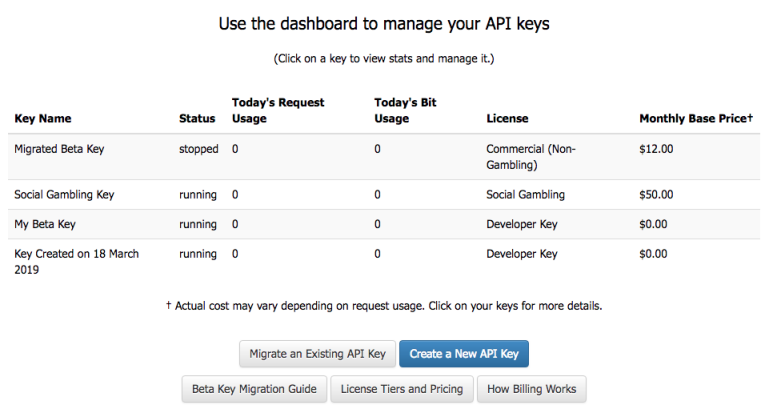 Once your key has been converted, you can return to the API Dashboard to confirm that everything looks as expected. Please don't hesitate to get in touch, if you have questions about the conversion process.